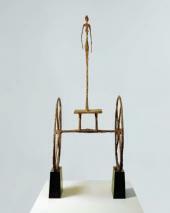 The exhibition 'Alberto Giacometti. Sculpture, Paintings, Drawings" is the latest in the Pushkin Museum of Fine Arts' series of large-scale international projects, which in themselves reflect much more than ideas brought about by the long examination of its own collections. The museum researchers' inquiring minds and painstaking efforts have always been aimed at projects illustrating different stages of arts history that fill in the gaps of the museum's existing displays. Such projects introducing Modernist artists and classics of 20th-century avant-garde art have included exhibitions devoted to Pablo Picasso (the first in Russia), Amedeo Modigliani, Raoul Dufy, Joan Miro, Salvador Dali, Rene Magritte, Piet Mondrian, and Andy Warhol. 40 years ago such shows were a veritable cultural shock, a bold display of a different art language against the background of the 'aestheti-cized mythology" of the totalitarian state. 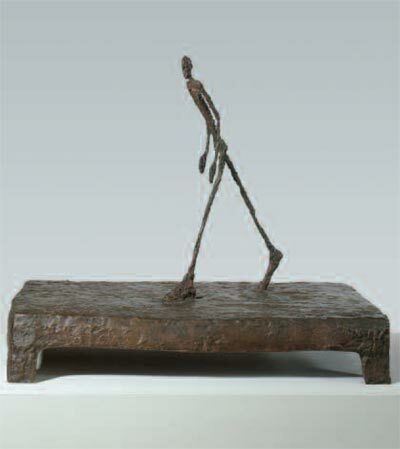 It would not be an overstatement to say that the Giacometti exhibition is a landmark in Russia's cultural life. Preparations for the first show of the artist's considerable legacy in Moscow and St. Petersburg faced many hurdles which, in spite of the reciprocal interest of its participants, sometimes appeared insurmountable. It took quite a while for all parties to agree to mutually acceptable terms for loaning, transporting and displaying the artwork. The negotiations with the Swiss partners, which lasted for several years, reached deadlock twice. But finally, in summer 2008, an agreement was signed by the Beyeler Foundation in Basel, the Art Museum and the Alberto Giacometti Foundation in Zurich, and two of Russia's major museums — the Hermitage and the Pushkin Museum of Fine Arts. That the project was ultimately achieved, enjoying real success with viewers, justifies the effort put into organizing the exhibition. As early as the 1930s Alberto Giacometti (1901-1966) won heartfelt recognition among the bohemian community in Paris; in the 1940s he became popular in America thanks to shows at Pierre H. Matisse's gallery; and in the 1950s he became an undisputed leader of the European avant-garde. But until now the work of this legendary, internationally famous artist was little known to Russian viewers. Many regarded his art as a reflection of contemporary philosophical ideas and analyzed how different avant-garde trends influenced the development of his style. The theoretician of surrealism Andre Breton believed that Giacometti's sculptures were an ideal illustration of surrealist aesthetics. 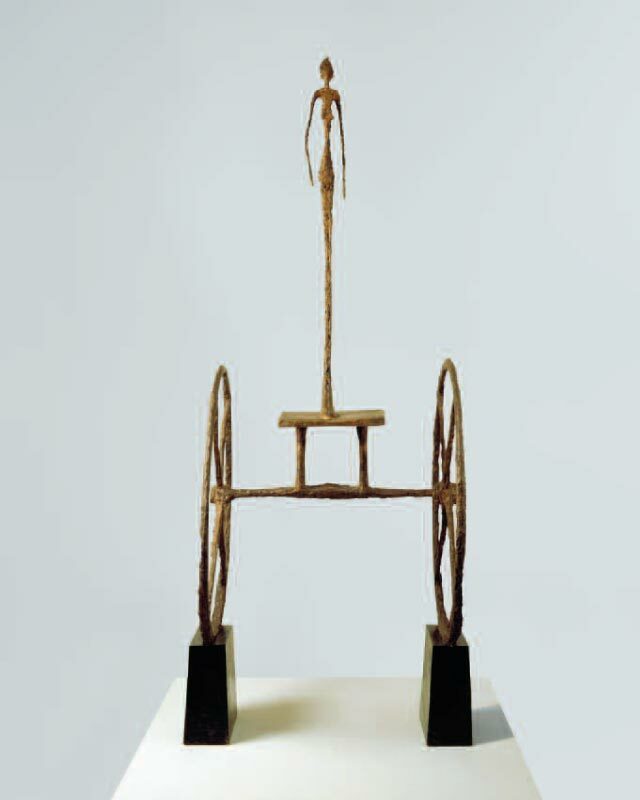 The French philosopher and playwright Jean-Paul Sartre believed that Giacometti's art was based on the principles of phenomenology; he wrote that Giacometti's images were "always halfway between 'nothingness and being'". The essay about the artist, written in 1947 and titled "The Search for the Absolute" ("La Recherche de l'Absolu") is an analysis of the existential essence of his art. However, Giacometti himself, who left us a journal tracing the evolution of his style in notes and literary works, was against theoretically linking his work to any trend in philosophy or any art movement. 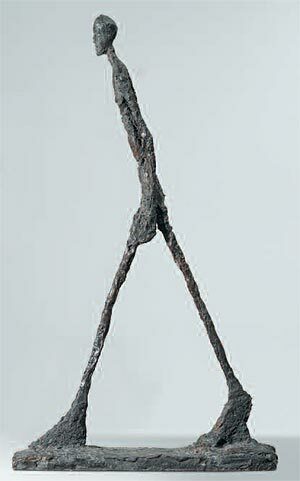 Shunning scandal and high-sounding manifestos, Alberto Giacometti conveyed in his sculptures his feelings. He acknowledged: "Mostly I work for the sake of emotions I experience when I create." Giacometti's frantic devotion to work is well known — when he got carried away, he would take no notice of time, would feel neither hunger nor fatigue, and would go without sleep for days. He was obsessed with art and put all his energy into his search for ways to penetrate the nature of things, trying to discover the true foundation of existence. Giacometti gained his first art experience in the studio of his father, the Swiss painter Giovanni Giacometti. Alberto became aware of the power of his talent early on: "As a child I was infinitely happy and enjoyed thinking that I could paint everything I saw." Impressionable and exceptionally gifted, Giacometti came of age in a creative environment: in his parents' house in the tiny municipality of Stampa many items — furniture, carpets, chandeliers — were made either to his father's design or by his father's hands. Alberto had at his disposal the family's library with a very rich collection of art books. He copied the works of old masters from their illustrations, and painstakingly studied drawing and painting. Travel to Italy and acquaintance with the works of old masters, such as Tintoretto, Giotto, and Mantegna, became for the young artist an important stage in the awakening of his artistic individuality. Later he reminisced that it was then that he first felt the despair of a person seeking the unattainable in art — seeking to reflect a true life hidden behind the illusory "realness" of the material world. 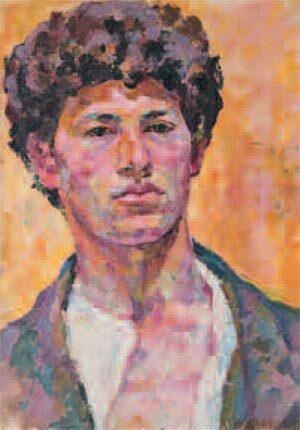 The artistic talent of 20-year-old Giacometti bloomed when he moved to Paris, became a student at the Academie de la Grande Chaumiere, and started studying at a workshop of the "frantic" Antoine Bourdelle. The dynamism and inner drama of Bourdelle's sculptural works were very close to Giacometti's still undefined artistic search. At the same time, the shy provincial lad was stunned by the drive and energy of the artistic life in the cultural capital. In that period he made drawings and sculptures, energetically trying many of the techniques developed by contemporary artists. He lived through successive periods of enthusiasm for Cubism and Dadaism, and became an eager adept of Andre Breton, when the latter brought out his second manifesto of surrealism with its "revolutionary," political thrust. Following his older colleagues' advice, Giacometti visited the ethnography department of the Museum of Man (Musee de l'Homme), where he was fascinated by the forms of the primitive art of Africa and Polynesia. With the enthusiasm of a neophyte, Giacometti overcame the influence of the artistic manner in which he had been schooled — his father's style — accusing it of inadequacy. In the excitement of a "new convert" avant-garde artist he committed an act of familial blasphemy by publishing in Breton's magazine "Surrealism in the Service of the Revolution" ("Le Surrealisme au service de la revolution") his essay "Yesterday, Quicksand" ("Hier, sables mouvants"). Based on the facts of his own life, the essay also contained a malicious attack on his past. The sadistic pleasure he felt when torturing insects, violence against his family members, and finally, the mortal sin of fratricide — all this was spurted out by the author with the joy of a child intoxicated by his audacity and impunity. 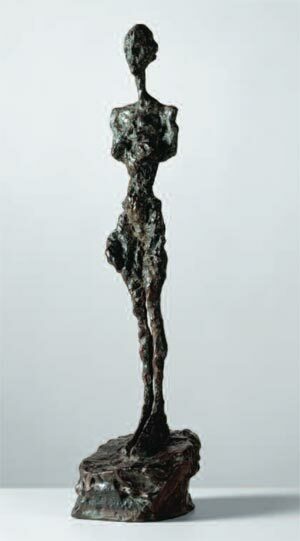 His father's death, which followed shortly after, traumatized and sobered up Giacometti. He anxiously absorbed all that was new, and had a talent for masterfully rendering it in art, visually conveying the meaning of his insight. But he was quick to lose interest if the object was not in line with his artistic goals. Collaboration with a group of surrealists left a major imprint on his art, and yet it was just a preamble to his "high style". Honore de Balzac's short story "The Unknown Masterpiece" ("Le Chef-d'oeuvre inconnu") which Alberto Giacometti read in the early 1940s became for him an artistic manifesto of sorts. Eloquently and simply Balzac put into words and summarized the goal of the artist's agonized quest. Wisdom itself speaks through the painter Frenhofer: "Beauty is a thing severe and unapproachable, never to be won by a languid lover. You must lie in wait for her coming and take her unawares, press her hard and clasp her in a tight embrace, and force her to yield. Form is a Proteus more intangible and more manifold than the Proteus of the legend; compelled, only after long wrestling, to stand forth manifest in his true aspect. 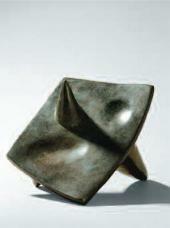 Some of you are satisfied with the first shape, or at most by the second or the third that appears. Not thus wrestle the victors, the unvanquished painters who never suffer themselves to be deluded by all those treacherous shadow-shapes; they persevere till Nature at the last stands bare to their gaze, and her very soul is revealed." Working with human models Giacometti was least of all interested in shallow reproduction of the outward appearance, the clumsy human flesh. Peeling off the accidental and superficial from the world he was creating, the artist cast aside the mortal flesh of the material, finally laying bare the fantastic energy of spirit. 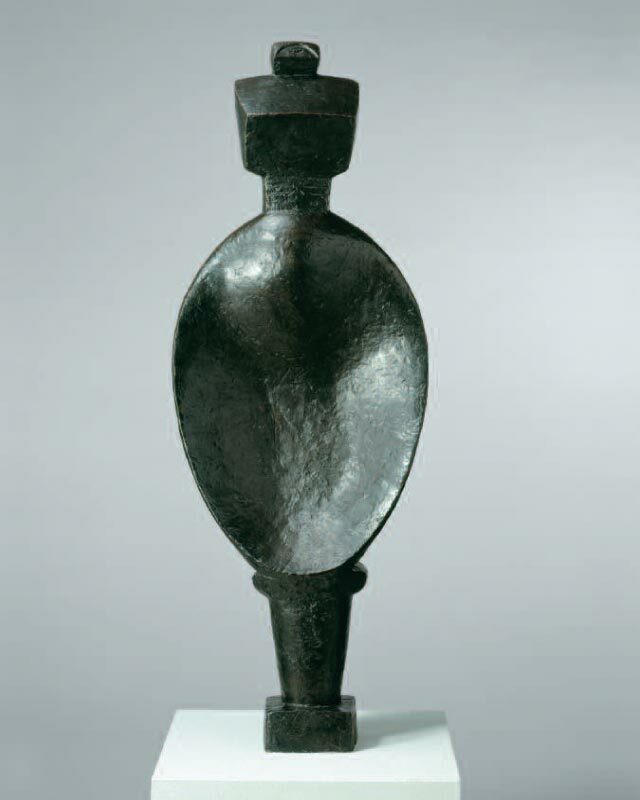 Year after year Alberto Giacometti worked to overcome the resistance of matter, giving it voice and making it vibrate like a tuning-fork conveying the artist's emotional strain. His models are beings with a naked nerve. The extreme psychol-ogism of his images is full of suffering. 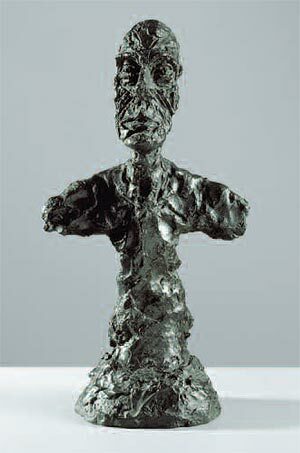 Like the literary masterpieces of Franz Kafka, Albert Camus, Sartre, and Samuel Beckett, Giacometti's works are a visual embodiment of the tragic sentiment of humans abandoned by God. Giacometti changed the perception of traditional visual arts, combining the techniques of iron moulding and those of moulding the plane of a painting. His breakthrough in art consisted in eliminating the very essence of sculpture — he "abolished volume", deforming his figures to the point when they are thin as knife-blades. The see-through structures were a protest against the traditional language of sculpture with its emphatic palpability and weightiness. The narrow vertical lines of the nearly fleshless models absorb and hold any sort of space — from the interior of a museum to city squares, saturating everything around with a special magnetism. The models do not call for unhurried contemplation, or any kind of smooth walk-around: his sculptures are pointed and expressive, and they dominate the space as giant, sharply-drawn graphic images. 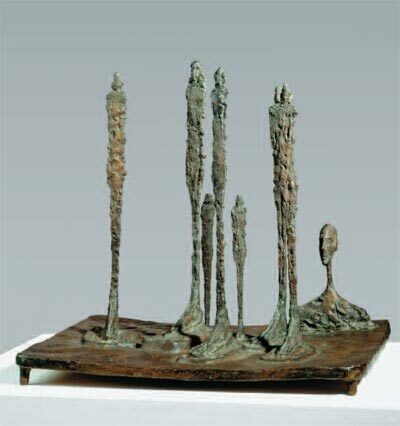 The surface of the bronze castings retain the prints of Giacometti's hands as he touched the clay. Their refreshing materiality together with the masterful artificial patination of the bronze and intricate colour shadings from a warm ochre to cool tints of green bring to our minds, among other things, spacial paintings. His paintings and drawings, conversely, are marked by sculptural techniques: the artist did not secure his images within sharply drawn silhouettes but seemed to be modeling objects, bodies and faces grappling for their form and accurate position in space by tracing the lines again and again. The plane of the paper or the canvas gained volume, and the streamlined strokes were weaving the image, preserving the dynamics of the sculptor's keen eye. The artist unexpectedly found solutions to the challenges he identified for himself in the simplest things — thus, a pedestrian crosswalk sign inspired, in the late 1940s, a whole series of figures of "Men Walking" and "Men Crossing a Space", and the models of sculptures hugged in a corner of the cramped Parisian studio formed a composition and a fresh image ("Forest", 1950). 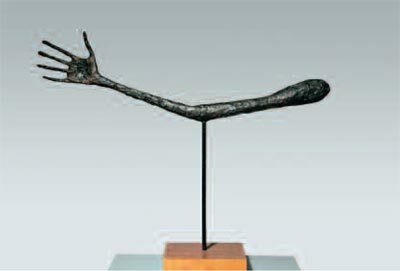 Giacometti's sculpture "The Hand" (1947) was inspired by his favorite story of Balzac — the artist left many sketches on the margins of his favorite book. He literally made an illustration to the words of one of the story's characters who said that the plaster cast of a live person's hand forever remains but a dead mass: "The aim of art is not to copy nature ... We must detect the spirit, the informing soul ... a hand ... is not only a part of a body, it is the expression and extension of a thought that must be grasped and rendered." He was discontented as only a genius could be: "All that I can achieve is so insignificant in comparison to what I can see, and would be likely tantamount to ruin." With these words Alberto Giacometti expressed the true feelings of a person who was obsessed with art and whose creative goals imparted meaning to his life. In a great measure it was thanks to his brother, the talented sculptor and designer Diego Giacometti, that these goals were fulfilled. For over 40 years Diego lived in the shadow of his exceptional brother Alberto. Diego's faithful service to his older brother, and moral and financial support, help in the realization of ideas and, finally, the accomplishment of the most important part in the process of creating a sculpture — casting clay models in bronze in his own foundry — proved a true feat. Diego's collection, together with the artist's wife's Anette Arm collection and the gifts from younger brother Bruno, became the basis of the Alberto Giacometti Foundation in Zurich, whose reserve items have been loaned for the Moscow exhibition. 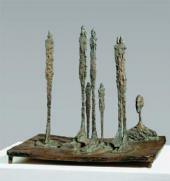 The small show featuring about 60 of Giacometti's works spans all periods of his artistic life, beginning from an early self-portrait influenced by his father's style to his last project — a sculptural composition for the plaza in front of the Chase Manhattan Bank Headquarters in New York.